Birding Is Fun! : Ask the Avimor Bird Guy: Chukar in town? From JoAnn working at RC Willey: Brian took this picture with his phone of a bird in our parking lot. He says its a Chukar. Is that what it is? Avimor Bird Guy: It is hard to tell from the picture, but based on the size and posture Brian is probably correct. 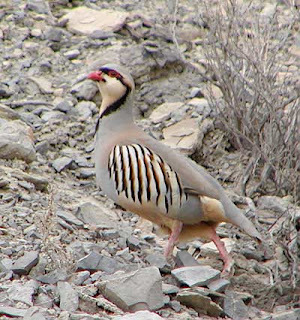 Chukar are usually found in steep canyons with rocky terrain where some water source is available nearby. Hunters say they are the hardest upland game birds to hunt because they move quickly in terrain that is hard for even the fittest among us to navigate. We have some Chukar here at Avimor up along Spring Valley Creek Trail. I saw dozens of them when I took a jet-boat tour up Hells Canyon on the Snake River along the Idaho-Oregon border. I would guess that the bird Brain photographed was probably a pen-raised Chukar. There are dozens of folks in the Treasure Valley that pen-raise Chukar and I have seen them around town in the oddest places before too. I suppose people raise game birds simply for the pleasure of having them around the yard or to release them for hunting. My boss at Avimor, who lives in Meridian, just a few miles from RC Willey, just moved into a home where the previous owners raised Chukar and Pheasants. The Chukar have recently disappeared from the neighborhood, so perhaps one wandered all the way up to where you work. Part of the partridge family of birds, the Chukar is originally from Pakistan. There are now a few locations around the world where they were introduced and survive and breed in the wild. I have heard they are one of the best tasting upland game birds, so if any of my friends that are hunters get one, I'd like to taste the meat. Just found you on Bill of the Birds. I used to live in Idaho in the Pashimeroi Valley in a little town called Moore. I only lived there for 2 years back in the 80's but Idaho has been the love of my life ever since! So, when I saw you were from Idaho, I just had to come stop by! When I lived in Central Maine I saw 2 chukars one day. At that time I had never seen one and I did not know what it was. When I looked it up in my bird guide I was shocked and contacted the local Audubon chapter. I also sent them photos as proof. About a week or 2 later I found out why they were there when I met the neighbor who raised them and then released them. I don't think they lived for very long in the wild for I never saw them again. Glad to see you eBird. I saw so many birds the 2 years that I lived there, but only recorded a few sightings! I know I saw a swan and Sandhill cranes in Moore, but I did not write down the dates anywhere that I can find so I have not added them to my eBird list. How I wish I could contribute this information to eBird.